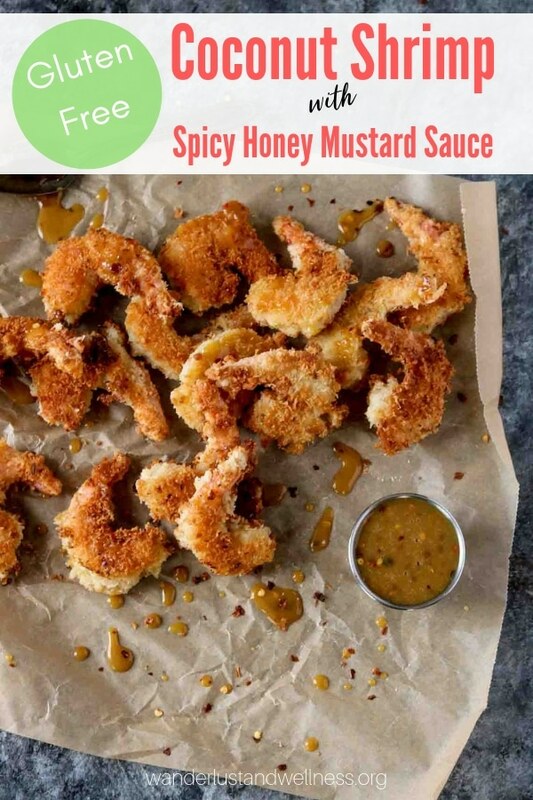 Add another delicious gluten-free appetizer to your recipe box with this coconut shrimp with spicy honey mustard sauce. 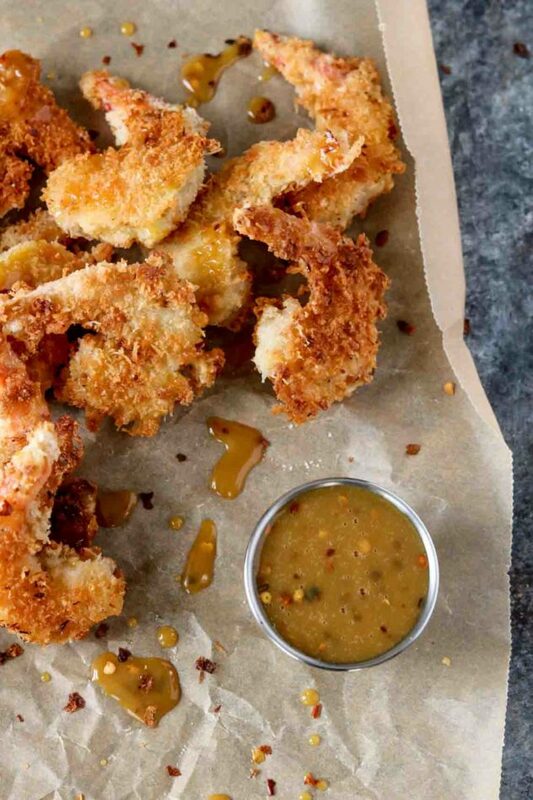 With a simple gluten-free coconut breading and a spicy honey mustard dipping sauce – it’s the perfect party appetizer! Another delicious appetizer recipe – this coconut shrimp with spicy honey mustard sauce is both gluten-free and Paleo friendly! The breading is PERFECT, with the right amount of crunch and the right amount of coconut. Then add in the spicy honey mustard sauce, and you’ve got yourself one killer combination. Here at Wanderlust and Wellness, we believe in intuitive eating and not labeling foods as good vs. bad, of course excluding any food sensitivities or allergies. With that being said, we encourage you to review the nutritional label of the recipe to answer any specific questions. For this recipe specifically, yes, it is gluten-free. 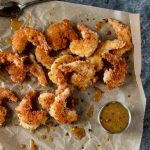 For this coconut shrimp with spicy honey mustard sauce, you’re going to use tapioca flour and gluten-free breadcrumbs to make a tasty gluten-free and Paleo-friendly appetizer. As I always say, going gluten-free does not mean you have to sacrifice flavor or even some of your favorite foods. This coconut shrimp recipe is another healthier alternative to a crowd favorite! 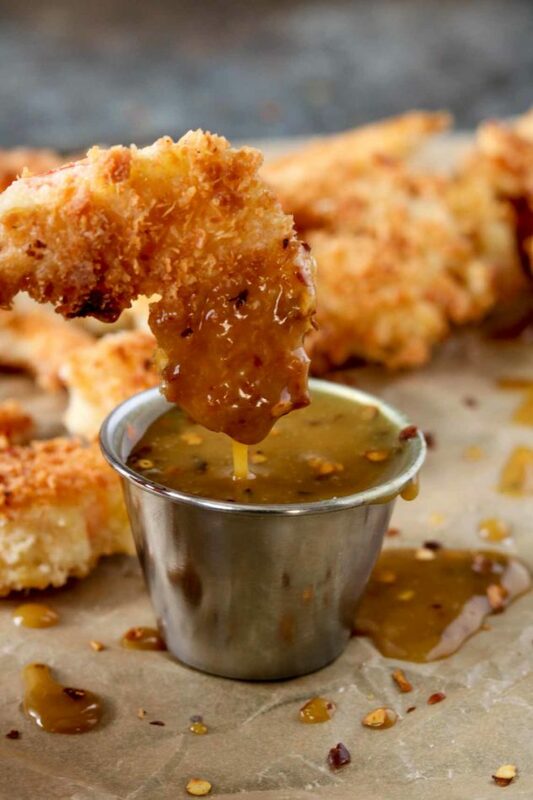 Simply combine the ingredients to make the spicy honey mustard sauce. Enjoy these other coconut recipes! This coconut shrimp with a spicy honey mustard dipping sauce is a delicious gluten-free party appetizer! In 3 separate small bowls, add the flour to one bowl, the eggs to the 2nd bowl, and the coconut and bread crumbs to the 3rd bowl. Using a fork, whisk the eggs until blended. Using your hands, blend the coconut and bread crumbs as well. In a large frying pan, melt the coconut oil over medium heat. Depending on your pan size you may have to add more oil. You want enough oil to cover the entire pan and be about 1/8-1/4 of an inch deep. Once the oil is melted and heated up, begin dipping your shrimp. First dip the shrimp into the flour, coating well. Then dip into the egg, then finally thoroughly coat in the coconut and bread crumbs. Place shrimp into heated coconut oil. Continue the process until your pan is full, but do not crowd the shrimp. Fry the shrimp for about 2 minutes, then flip and continue flipping back and forth until you have a nice golden brown breading. Once finished, remove the shrimp and place onto a paper towel lined plate while you finish the remaining shrimp. Continue the process until all shrimp are cooked. Combine sauce ingredients into a small saucepan and heat on medium low until warm. Serve on the side with the shrimp. If you prefer not to pan-fry, you can cook these in an air fryer.